Here are the details of the upcoming Church House Concerts. Most are all held at the Church House in South Tawton, Nr South Zeal, Nr Okehampton. For directions click here. If the concert is in the Victory Hall, South Zeal further information is available by clicking here. If the concert is in at Andrews Church, South Tawton it is adjacent to Church House itself. Hailing from Lancashire, Henry is a slide guitarist and harmonica player. He has immersed himself in the music of the Deep South of America, traditional music of the British Isles, and Indian classical music. Specializing in lap slides techniques, his Dobro playing draws together these diverse influences. His harmonica style combines country blues and folk styles with beat-boxing to create a 21st-century harmonica sound heavily steeped in tradition. Martin is a singer-songwriter and multi-instrumentalist from Devon. 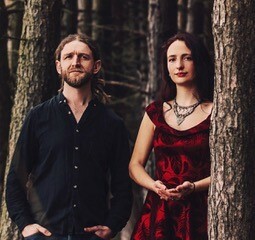 Writing mainly on fiddle, viola, and banjo, and drawing on the traditions of the British Isles The concert is one in a series of preview tours to showcase their new album. As this event is in the church, seating will be in pews so feel free to bring a cusion if you prefer to sit on something softer.